The location visited by our groups visiting the Holy Land is located on the Jordan River not far from where it flows out of the Sea of Galilee and begins its route south to the Dead Sea. The Yardenit Baptismal site is run by a local kibbutz and is a tranquil, well designed and administered location to remember or renew your baptism or be baptized for the first time. Christ's baptism in the Jordan would have happened further south and much nearer to the Dead Sea. That area was problematic for many years as the Jordan River also marked an international border. As peace relations now exist between Israel and Jordan, an area recognized by centuries of pilgrims is well developed on the Jordanian side of the Jordan River at Bethany Beyond the Jordan and an overlook area now exists on the Israeli side at Kasr el Yehud. 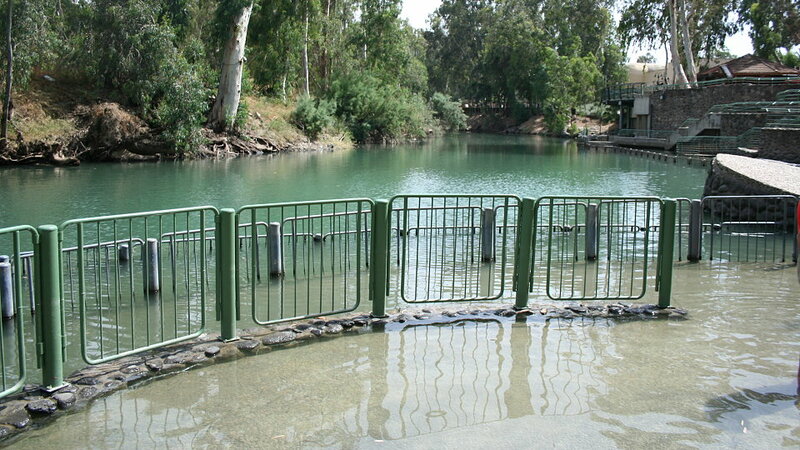 Due to agricultural uses, water in this part of the Jordan River is minimal. The Jordan River albeit small in length was once a larger river with a large flood plain, much like the Nile, north of the Dead Sea. Abraham and Lot survey the cities of the plain from Bethel and the region was fertile at that time. The Jordan was a line of demarcation for the Israelites returning to the promised land and other times subsequently in history. 4: Unto the place of the altar, which he had made there at the first: and there Abram called on the name of the LORD. 1: And Joshua rose early in the morning; and they removed from Shittim, and came to Jordan, he and all the children of Israel, and lodged there before they passed over. 7: And the LORD said unto Joshua, This day will I begin to magnify thee in the sight of all Israel, that they may know that, as I was with Moses, so I will be with thee. 23: And the men of Israel gathered themselves together out of Naphtali, and out of Asher, and out of all Manasseh, and pursued after the Midianites. 24: And Gideon sent messengers throughout all mount Ephraim, saying, Come down against the Midianites, and take before them the waters unto Beth-barah and Jordan. Then all the men of Ephraim gathered themselves together, and took the waters unto Beth-barah and Jordan. 25: And they took two princes of the Midianites, Oreb and Zeeb; and they slew Oreb upon the rock Oreb, and Zeeb they slew at the winepress of Zeeb, and pursued Midian, and brought the heads of Oreb and Zeeb to Gideon on the other side Jordan. 1: And it came to pass, when the LORD would take up Elijah into heaven by a whirlwind, that Elijah went with Elisha from Gilgal. 2: And Elijah said unto Elisha, Tarry here, I pray thee; for the LORD hath sent me to Bethel. And Elisha said unto him, As the LORD liveth, and as thy soul liveth, I will not leave thee. So they went down to Bethel. 3: And the sons of the prophets that were at Bethel came forth to Elisha, and said unto him, Knowest thou that the LORD will take away thy master from thy head to day? And he said, Yea, I know it; hold ye your peace. 4: And Elijah said unto him, Elisha, tarry here, I pray thee; for the LORD hath sent me to Jericho. And he said, As the LORD liveth, and as thy soul liveth, I will not leave thee. So they came to Jericho. 5: And the sons of the prophets that were at Jericho came to Elisha, and said unto him, Knowest thou that the LORD will take away thy master from thy head to day? And he answered, Yea, I know it; hold ye your peace. 6: And Elijah said unto him, Tarry, I pray thee, here; for the LORD hath sent me to Jordan. And he said, As the LORD liveth, and as thy soul liveth, I will not leave thee. And they two went on. 8: And Elijah took his mantle, and wrapped it together, and smote the waters, and they were divided hither and thither, so that they two went over on dry ground. 9: And it came to pass, when they were gone over, that Elijah said unto Elisha, Ask what I shall do for thee, before I be taken away from thee. And Elisha said, I pray thee, let a double portion of thy spirit be upon me. 10: And he said, Thou hast asked a hard thing: nevertheless, if thou see me when I am taken from thee, it shall be so unto thee; but if not, it shall not be so. 11: And it came to pass, as they still went on, and talked, that, behold, there appeared a chariot of fire, and horses of fire, and parted them both asunder; and Elijah went up by a whirlwind into heaven. 12: And Elisha saw it, and he cried, My father, my father, the chariot of Israel, and the horsemen thereof. And he saw him no more: and he took hold of his own clothes, and rent them in two pieces. 14: And he took the mantle of Elijah that fell from him, and smote the waters, and said, Where is the LORD God of Elijah? and when he also had smitten the waters, they parted hither and thither: and Elisha went over. 15: And he returned to the man of God, he and all his company, and came, and stood before him: and he said, Behold, now I know that there is no God in all earth, but in Israel: now therefore, I pray thee, take a blessing of thy servant. 1: And the sons of the prophets said unto Elisha, Behold now, the place where we dwell with thee is too strait for us. 2: Let us go, we pray thee, unto Jordan, and take thence every man a beam, and let us make us a place there, where we may dwell. And he answered, Go ye. 3: And one said, Be content, I pray thee, and go with thy servants. And he answered, I will go. 4: So he went with them. And when they came to Jordan, they cut down wood. 5: But as one was felling a beam, the axe head fell into the water: and he cried, and said, Alas, master! for it was borrowed. 6: And the man of God said, Where fell it? And he shewed him the place. And he cut down a stick, and cast it in thither; and the iron did swim. 15: And Jesus answering said unto him, Suffer it to be so now: for thus it becometh us to fulfill all righteousness. Then he suffered him. At Yardenit, the baptismal site near Tiberias, one should pause and reflect on the ordinance of Baptism and what it represents. Jesus expounds to Nicodemus that man cannot see the kingdom of God unless they are born again of the Holy Spirit. Baptism and the profession of faith that is attendant to the service is a physical representation of this new birth of the Christian. Consider John 3 and the power and love of God to send His son that the Christian might have eternal life through His blood and the quickening of the Holy Spirit.